Son of Ernie McMillan, a former NFL offensive tackle, McMillan was an All-Big 8 selection in his last collegiate season and was taken by the Jets in the third round of the 1988 NFL draft. In an effort to bring greater speed to the defensive backfield, the club used three of its first four picks on defensive backs (the other two were Terry Williams and James Hasty). He became the starting free safety and proved to be one of the fastest in the league at that position. Jets went 8-7-1 to finish fourth in the AFC East while leading the conference in interceptions (24). Daring and aggressive, McMillan was again selected to the Pro Bowl in 1989 after intercepting six passes, one of which he returned 92 yards. However, a change in defensive schemes affected his performance adversely in 1990. His play became marked by inconsistency and, following the ’92 season, he was signed by the Philadelphia Eagles as a free agent. 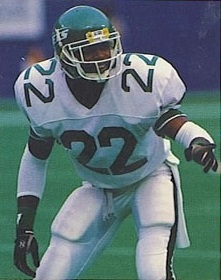 McMillan failed to last the year with the Eagles and made appearances with the Chiefs and Browns in what was his final season. Overall, over the course of six years he intercepted 22 passes, five of which he returned for touchdowns, but he failed to live up to the promise of his first two seasons in the NFL.